388 Adapter. Replacement for 388, Bulova 211, Varta 503 discontinued Mercury cells. Contents: Kit contains 1 x 388 Adapter, 1 x 396 silver oxide cell. Output Voltage: 1.35 V.
Price: £12.90 each. Postage and packing included. Emulates: SSIH 9910, Varta 503, Bulova 211, Mallory 10R10, Accucell-2. 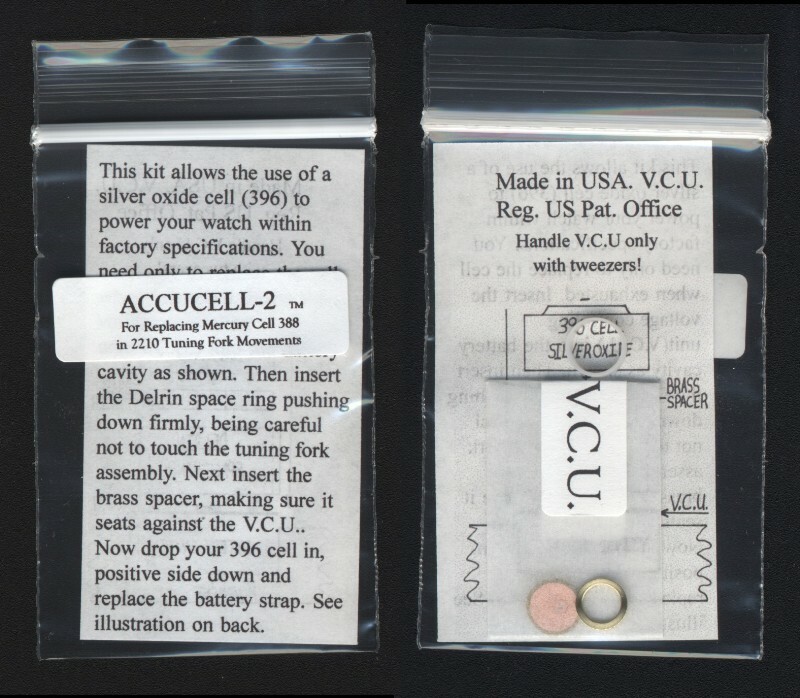 The 388 mercury cells, used to power 221 / 2210 models of the Accutron tuning fork watches, are no longer manufactured because of their toxicity and environmental unfriendliness. This voltage reducing 388-Adapter kit is the "Rolls Royce" solution to problem of the discontinued Mercuric Oxide 388. Our 388 Adapter has the outer dimensions of the 388 mercury cell but takes the inexpensive and easily obtained silver oxide 396 cell. Buried within the 388 Adapter are micro electronics that drop the voltage from the 1.55 Volts put out by the silver oxide cell to the 1.35 Volts that your watch was designed for. No adjustment or modification to your watch is required. The 388 Adapter does not require activation or a supply of air. 388 Adapters are a one time purchase, and will last a lifetime. Simply replace the expired silver oxide 396 cell with a fresh one. The movements of tuning fork watches run well on 1.32 to 1.41 volts. The 388-Adapter was developed to output the proper voltage to run these movements exactly as would the original 388 mercury cell. The 388-Adapter will power your Bulova Accutron watch for about 9-10 months (as compared to the original mercury cell that might last between12 and 15 months. Click here to purchase extra 396 cells. An inexpensive 388 replacement is the silver oxide cell, the 329, SR730SW or SR731SW. They are a fraction smaller than the 388,but often work well where 1.55 Volts is acceptable. Alternatively, we supply a 329-to-388 converter, a small plastic spacer that bulks out the 329 or SR730SW to be the same size as the withdrawn 388 cell. To replace a 388 with a silver oxide cell we recommend you purchase two items from us, a 329 cell and a 329-to-388 converter. For more background information, find out about mercury replacement batteries. A correctly tuned Accutron will not run fast with a silver oxide battery, but a slightly 'off' Accutron can gain time with the 1.55V battery but be fine with the old 1.35V. This is a process called double indexing whereby the slightly greater amplitude of the tuning fork means it can occasionally take two clicks forward when it should only take one, hence gaining time. If your watch gains time you can consider an expensive service of your watch or simply use the voltage reducing 388-Adapter.